Runewriters: Merry Christmas and Happy Holidays!!! 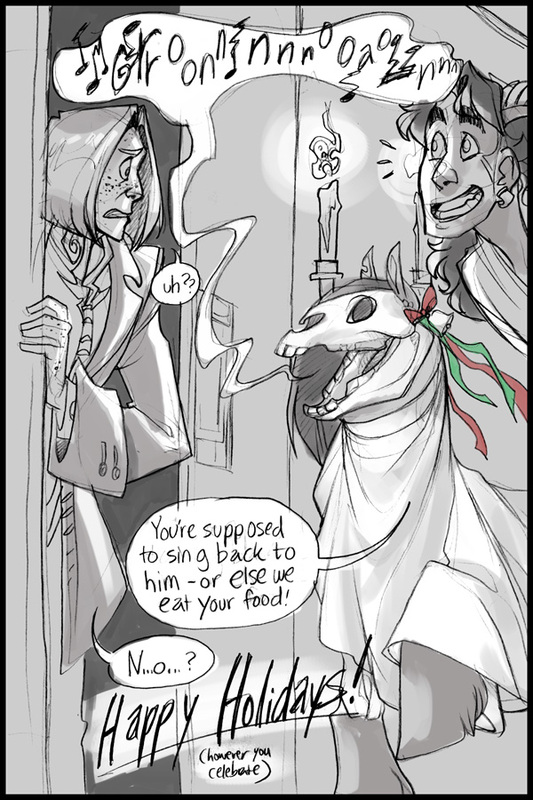 c'mon esra you're like..... fantasy British, surely you've heard of Mari Lwyd??? my Welsh buddy Himochi told me about this amazing celebration where a horse skull ghost has a rap battle with innocent home owners and if it wins it gets to come in and drink all your alcohol?? WHY DONT WE HAVE THIS??? anyway all I could think of is how excited necropony would be to be part of this. Sev is on board. Jonan doesn't want to be seen with any of them.